The early morning of 20 February found units of VAC about to embark upon two distinct phases of the fight for Iwo Jima: the capture of formidable Suribachi in the south, and the long, exhausting drive to the north to clear the airfields and the remainder of the island. 37MM GUN fires against cave positions in north face of volcano in support of RCT 28. These light but extremely accurate weapons did some of their best work in the southern part of the island. 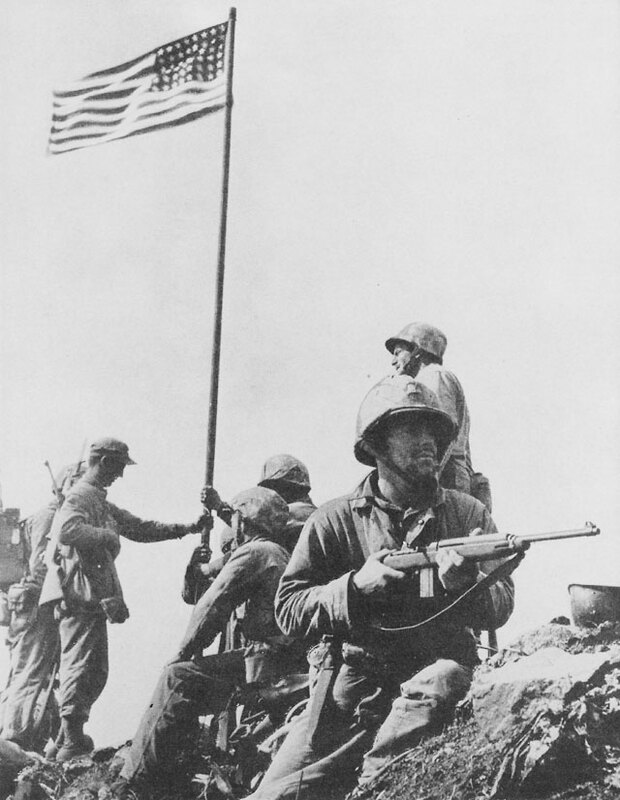 During the forenoon, Marines gained only 50-70 yards. Aircraft and ships pounded Japanese positions and the 3d Battalion, 13th Marines fired mission after mission, but stiff enemy resistance continued, particularly from well-camouflaged pillboxes hidden in the brush to the front of the Marine lines. These emplacements, too close to friendly troops to be engaged by heavy support weapons, could only be silenced by coordinated attacks of assault demolition teams using flamethrowers and explosive charges. At 1100, the tanks came forward, and with this support the attack continued from pillbox to pillbox. The 37mm guns and 75mm halftracks of the regimental weapons company were also brought close to the front and gave effective aid. Behind the lines, the 1st Battalion spent the day mopping up enemy positions bypassed during the D-Day assault. Although in reserve, it engaged in fierce close-quarter fighting and killed 75 of the enemy. Naval illuminating shells filled the hours of darkness with an eerie light, and Marines strained tired eyes to the south to detect hostile activity. White and amber pyrotechnic signals fired from Suribachi called down enemy artillery from the north to augment harassing fires from the mountain, but for a second night the expected counterattack did not develop. Although progress the first two days had been slow, it was felt that by the end of D-plus-2 the front lines would be so close to the base of the volcano that further support by aircraft would be impossible. For this reason, K-Hour on 21 February was preceded by a 40-plane strike. Attacking to within 100 yards of the front lines, these aircraft hit enemy positions that had given so much trouble the previous day. Particular attention was given to areas inaccessible to tanks. The 1st Battalion was assigned a one-company front on the right flank of the regimental zone and placed Company A on line next to the 3d Battalion. Otherwise, when the regiment moved out in the attack at 0825, units and boundaries were the same as the day before. Again tanks were unable to make the jump-off schedule because of delays in servicing. 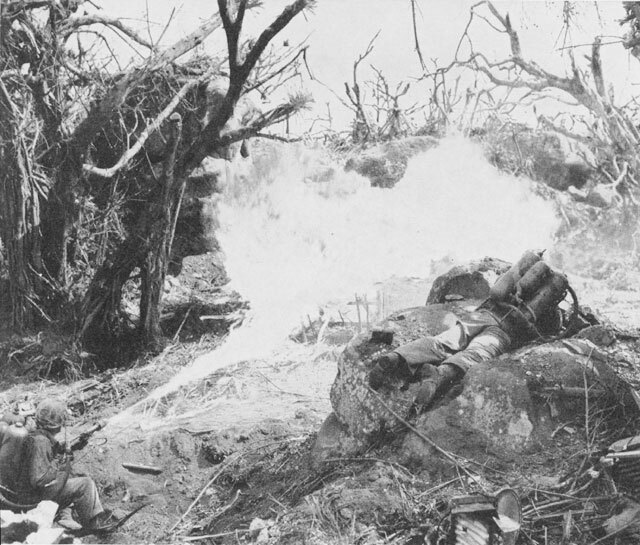 TWO FLAME THROWER OPERATORS team up to send twin streams of burning liquid into well-concealed Japanese position at foot of Suribachi. and C, the 1st Battalion advanced rapidly along the west beach to the base of the volcano. Although tanks could not be used in this sector, the attached 37mm platoon destroyed 11 enemy positions during the day. Companies B and C kept busy mopping up and clearing rear areas of snipers. The 3d Battalion, in the center, met heavy opposition from the positions that had held up the advance the day before. Only small gains were registered until the tanks arrived. Then, with armor, 37mm guns, and halftracks mounting 75mm guns in support, the attack gained a momentum by 1100 that was only temporarily checked by an enemy counterattack that struck 3/28's front at 1145. By 1400 the battalion had advanced almost to the foot of the mountain, and remained in position there for the rest of the day, although part of Company H fell back about 15 yards when a second enemy thrust hit at 1800. PATROL FINDS ROUGH GOING as it picks its way up the side of Mount Suribachi. 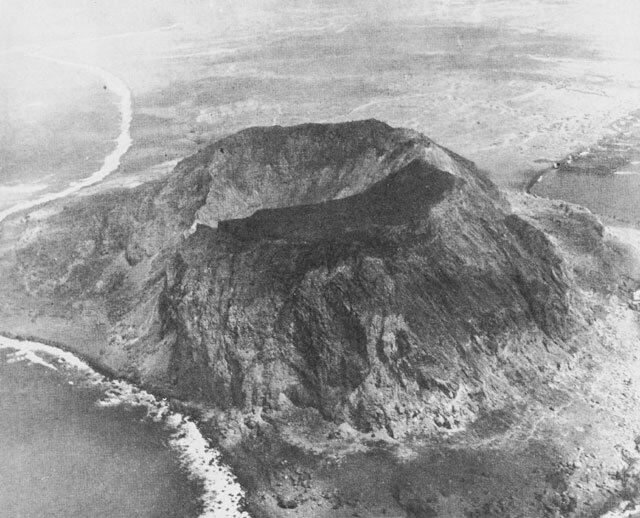 All paths up the volcano were obliterated by bombing and naval gunfire before the landing. ahead quite rapidly, but progress over the rugged terrain of the ledges 50-60 feet above the shore line was slow. Many positions were bypassed during this drive, but engineers and infantry with flame throwers were left behind to clean up. FAMOUS FLAG RAISING pictured in this photo by Mr. Joe Rosenthal took place after an unknown Marine obtained a set of colors from LST 779 to replace the stars and stripes first raised over the volcano. BLASTING CAVES on top of Suribachi. After securing the summit, Marines of RCT 28 spent days sealing caves and mopping up stubborn defenders. Most caves had multiple entrances. Note smoke issuing from both mouths of this underground position. E, which operated in the center during the day, was ordered to move to the left and relieve Company F. One platoon of Company D and 20 men from the 81mm mortar platoon filled the gap thus created. Heavy enemy fire from cliffs overlooking the east coast and throughout areas recently occupied held up the relief until after dark. Tying in was extremely difficult under these conditions, and it was 2300 before the Marines were settled in for the night. Company F reported that it had penetrated all the way to Tobiishi Point during the afternoon, but lines for the night did not extend that far south. Marines of RCT 28 now occupied positions that formed a semicircle in front of the north face of Suribachi, with 1/28 halfway around on the western shore and 2/28 a like distance along the eastern side. In the course of the day's action, regimental lines had moved 650 yards on the left, 500 yards in the center, and 1,000 yards on the right. hit but continued operations. Two other ships, the Keokuk (AKN 4) and LST 477, were also damaged.7 The LST, loaded with precious 3d Division tanks, was badly damaged but was able to unload on the beach before returning to Saipan. 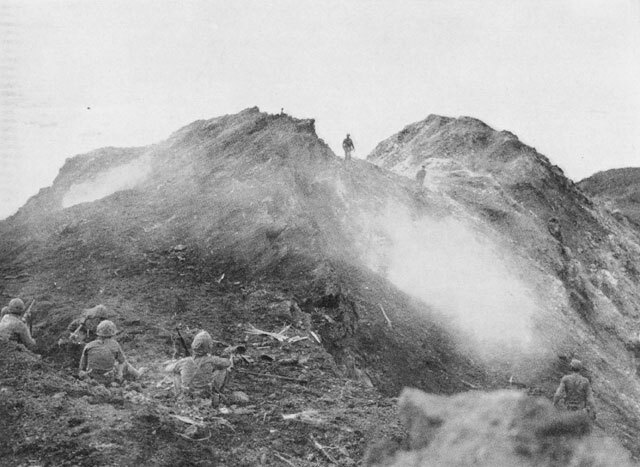 Dug in close to the volcano's steep face, Marines of RCT 28 could hear the defenders moving restlessly above them. Enemy artillery and mortar fire fell in the area throughout the night, but it was not so heavy now as during the day the regiment had moved to positions that were masked from most of the heavy weapons on the mountain. Two night infiltration attempts were repulsed. Men from the 81mm mortar platoon killed some 60 Japanese in front of 2/28 during one of these efforts, and Company C accounted for 28 who tried to move north along the western beach. 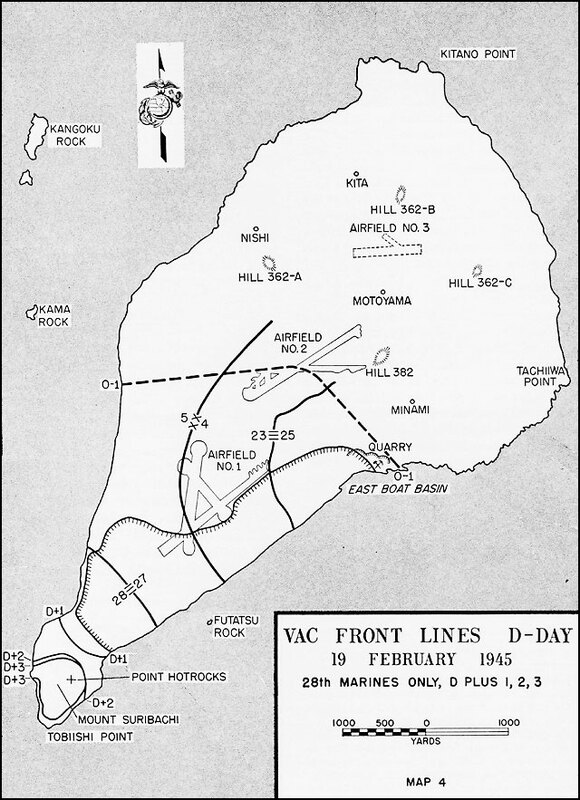 On 22 February (D-plus-3), the heaviest fighting occurred in the center of the regimental zone where 3/28 forced its way the remaining short distance to the base of Suribachi. Because of extremely rugged terrain and limited room for maneuver, it was impossible to use supporting fires of tanks and artillery to maximum advantage. Demolitions and flame throwers again proved the only way to silence enemy fortifications. On the right flank, the 3d Battalion squeezed out 1/28 and a patrol from Company G worked its way on down the west coast toward the southern tip. On the other side, the 2d Battalion continued mopping up and sent a group from Company E south along the east coast to meet the patrol from 3/28. Both these patrols looked for routes up the steep sides of the mountain but found none, as naval gunfire and aerial bombardment had destroyed the few previously existing trails. This was a miserable day. 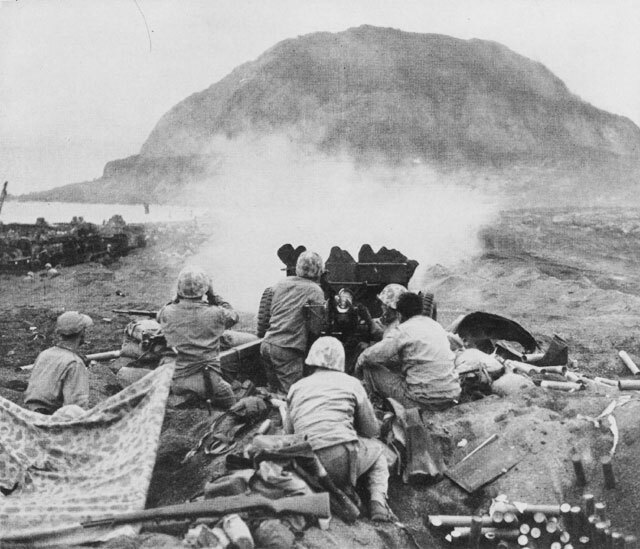 A cold rain, driven from the southeast by a 16- to 20-knot wind, soaked Marines to the skin and combined with volcanic ash to clog automatic weapons, reducing them to single shot effectiveness. But in spite of this temporary alliance between weather and enemy, RCT 28 had surrounded HOTROCKS by 1630, except for 400 yards on the west coast, where friendly fire prevented patrol contact. In the meantime, 1st Lieutenant Harold G. Schrier, executive officer of Company E, and a 40-man detachment set out to follow the patrols and occupy the highest point of land on Iwo Jima. 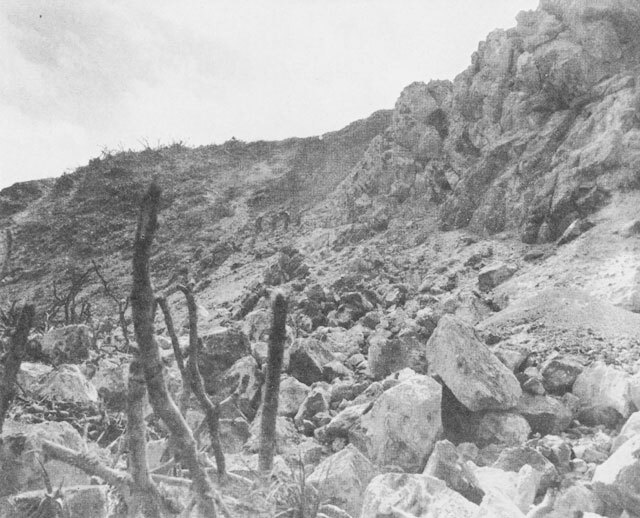 The number of live Japanese lurking in caves along this north face was unknown, so flankers were sent out to guard against ambush as Schrier's men clawed their way warily upward. Still there was a mysterious lack of enemy activity, and the only Japanese encountered were the harmless dead. Positions along the rim of the crater were reached at about 1015, and as Marines scrambled over the lip, the tenseness was eased by action. A small defending force challenged the patrol and a short, hot fight developed. 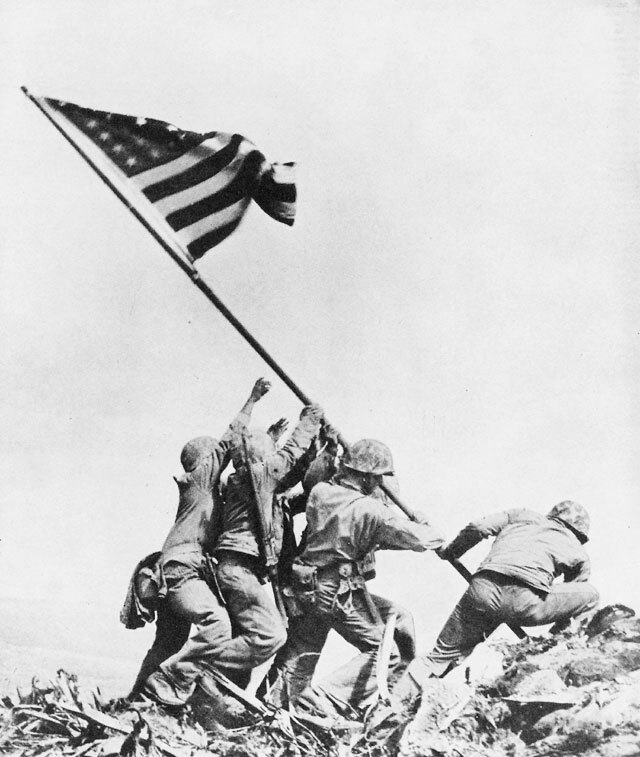 Even while this skirmish was in progress, some of the men located a length of Japanese iron pipe, secured a small American flag to one end, and raised the Stars and Stripes at 1020. It was an inspiring sight for thousands of Americans on Iwo as the flag waved bravely from the summit. During the afternoon, 2/28 continued mopping-up actions. All accessible outer and inner slopes were covered as the Marines annihilated enemy snipers and blasted shut the many cave entrances, sealing in an uncounted number of Japanese. Much observation equipment was found, emphasizing the fact that this had been an excellent point of vantage from which hostile observers directed murderous fire against the entire beachhead. Marine artillerymen, ready and eager to seize this advantage, hastened to move flash-ranging equipment into position. While part of Company E scaled the heights, another group from the same company patrolled down around the eastern end of the island to contact a unit from 1/28, which advanced down the other side to complete the encirclement of HOTROCKS. These patrols made contact near the southern tip at 1015. Neither unit met enemy resistance, but two men from 1/28 were lost in a land mine explosion. Engineers and demolition squads continued to assist the 1st and 2d Battalions in destroying enemy positions and sealing off caves around the bottom of Suribachi. Throughout the entire assault, RCT 28 drew heavily on the resources and skill of these men from the 5th Engineer Battalion. Landing with assault troops, they constantly proved indispensable in blasting enemy fortifications, carving routes through the rock for tanks, and probing for land mines. For the night defense on D-plus-4, 40 men from Company E remained on the crest, while the rest of the regiment manned positions around the base of Suribachi. During the hours of darkness, 122 Japanese were killed trying to infiltrate the lines. Most of these had demolitions secured to their bodies and were probably trying to reach command posts and artillery positions before destroying themselves. A few rounds of high-velocity artillery fell in the area and several 320mm mortar shells passed overhead to land out at sea. These projectiles were at first thought to be P-61 night fighter aircraft because of the peculiar sound made while passing overhead. The Japanese had conducted an effective defense. Making maximum use of their artillery, mortars, and automatic weapons, they did not waste themselves in costly all out counterattacks. Forcing the Marines to come to them, the enemy inflicted heavy casualties before being blasted or burned out of their fortifications. After five days of violent fighting, RCT 28's almost independent war on the southern end of Iwo Jima was marked with success, but the regiment remained in the south until D-plus-10, cleaning out die-hard Japanese, reorganizing, and reequipping. On D-plus-6 (25 February), at 0630, the 28th Marines reverted to corps reserve, and Colonel Liversedge, with his battalion commanders and staff officers, reconnoitered routes to the northern front where the rest of the corps was engaged in bitter fighting. 1. Point HOTROCKS, Lat. 24°45'11'' N; 141°17'28'' E. was designated by the navy as the reference point for reports of radar contacts in the Volcano Islands Area. Technically it was the name given to the highest peak of Mount Suribachi. In common usage, however, it came to refer to all of the mountain. TF 51 OpPlan, par 3 (x) (22) a. 2. Unless otherwise cited, material in this and the following sections of this chapter is based on the following: 28th Mar SAR; LtCol R.H. Williams, "Up the Rock on Iwo the Hard Way," Marine Corps Gazette, Aug 45. 3. VAC IntelRpt, 16, 17. 4. 5th MarDiv, Sec VIII, 19. 5. The following quote from the Special Action Report of Company C explains this delay: "We had eight tanks to place in action, however, no fuel or ammunition was available. Salvaging from knocked out tanks and redistribution was started. A heavy mortar barrage was placed upon us and we were forced to move to another position. Work had no sooner started in the new position and the barrage was upon us again. This occurred three times as there was no place to which we could move where we would not be under direct observation by the enemy on Mount Suribachi." 5th TkBn SAR, Encl C, 2. 6. These were planes of the 2d Mitate Special Attack Unit. They took off from Katori Airbase (near Yokosuka, Honshu), stopped over at Hachijo Jima (an island about 125 miles directly south of Tokyo Bay) for necessary supplies, then, toward evening, attacked the shipping off Iwo Jima. There were no survivors from this unit. Japanese Studies in World War II, No. 57, "Air Operations on Iwo and the Ryukyus." 7. TF 51 Rpt, Sec IV, 14. 8. 5th MarDiv D-3 Journal, Iwo Jima. 9. Ltr Lt(jg) Alan S. Wood, LST 779, to BrigGen R.L. Denig, 7Jul45, along with other corroborating data retained in the archives of the Historical Branch, G-3, HQMC. 10. Gen. H.M. Smith, Coral and Brass (New York, 1949), 261-262. 12. As quoted in TF 56 IntelRpt, 33. 13. 5th MarDiv SAR, Sec VII. 14. Approximately 1300 army and 640 naval troops were committed by Kuribayashi to the defense of the Suribachi area, 5th MarDiv IntelRpt, Map.